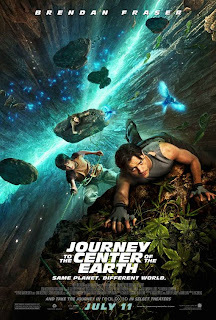 Trevor Anderson (Brendan Fraser) is a Bostonian volcanologist whose 13-year-old nephew, Sean (Josh Hutcherson), is supposed to spend ten days with him. Trevor learns at work that his brother's lab is being shut down because of a lack of funding. Trevor has forgotten that Sean is coming until he receives several messages from Sean's mother. When Sean's mother drops him off, she leaves Trevor with a box of items that belonged to Max, Trevor's brother and Sean's father, who disappeared years before. Sean suddenly takes interest in what Trevor has to say after he tells him about his father, whom he never really had a chance to know. Trevor discovers in the box Max's old baseball glove, a yo-yo, and the novel Journey to the Center of the Earth by Jules Verne. Inside the book Trevor finds notes written by his late brother. Trevor goes to his laboratory to find out more about the notes. There he realizes that he must go to Iceland to investigate for himself. He intends to send Sean back to his mother, but relents at Sean's protest and brings Sean along for the adventure. They start by looking for another volcanologist. When they get to that scientist's institution, they meet a woman named Hannah (Anita Briem), who offers to help them climb up to the instrument that has suddenly started sending data again. While hiking the mountain a lightning storm forces the three into a cave that collapses. Trevor, Sean, and Hannah investigate farther into the cave until they fall into a deep pit, taking them to the "Center of the Earth". They all continue until they discover a cave dwelling that Max lived in. Trevor and Sean find Max's old journal. Hannah and Trevor discover Max's dead body and bury him. Trevor reads a message from Max's journal that was written on Sean's 3rd birthday (8-14-97). This means that Sean's birth date is (8-14-94). Trevor continues to read Max's journal until he realizes from his notes that they must quickly leave, as the temperature is steadily rising. Trevor figures that they must find a geyser that can send them to the surface. They must do this in 48 hours or all of the water to create the geyser will be gone. They also figure that they must get out before the temperature rises past 135 degrees. They begin by crossing the underground ocean, and then the two adults become separated from Sean. Sean's guide is now a little bird who has been present since the trio entered the Center, and it takes him towards the river. However, he encounters a Tyrannosaurus and Trevor - who desperately is searching for him - saves him. When they arrive at the geyser it is all dried up. All of the water is on the other side of a wall. Trevor uses a flare to ignite the magnesium in the wall and causes a geyser to shoot them through Mount Vesuvius in Italy. When they destroy the home of an Italian man, Sean gives him a diamond that he had found earlier. Trevor sees that he has many more in his backpack, and he uses them to fund his brother's laboratory. Throughout the adventure, Hannah and Trevor gradually become so attached to each other that they kiss. The film ends on the final day of Sean's visit with Trevor (and now Hannah), and he is leaving their new home, which was purchased with some of the diamonds Sean took from the cave, and Trevor handing Sean a book titled "The Lost City of Atlantis", suggesting they could maybe hang out at Sean's during Christmas break, alluding to a possible sequel.